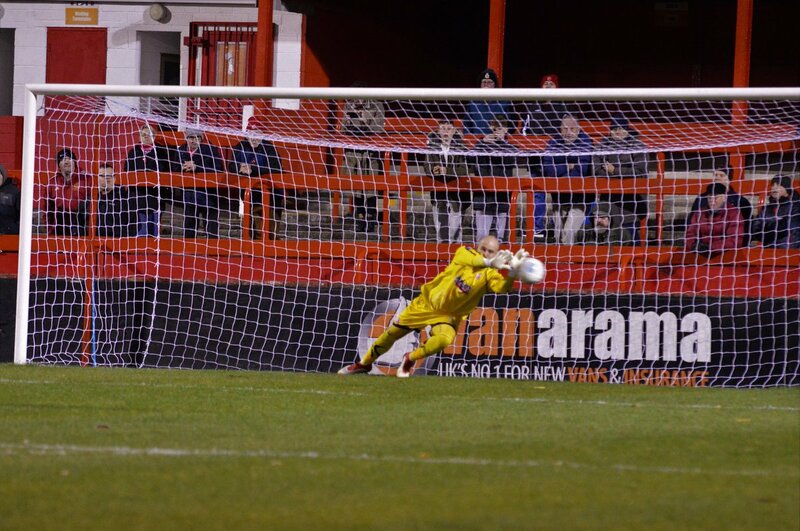 Alfreton Town progressed into the Third Round of the Derbyshire Senior Cup with a 5-4 penalty shootout win over Glossop North End, last night. Josh Gowling headed us into the lead on 20 minutes but Glossop fought straight back to level the contest with a fine finish from Mitchell Bryant on 24 minutes. The Reds created a load of chances with a variety of fringe players and Development team players gaining first team minutes including Tom Nicholson, Martin Riley, Kieron Hinchley and Callum Chettle. With the second half seeing both sides cancel each other out and Sanders making further important stops, both sides had to settle for penalties. With a flawless shoot-out standing at 5-4 thanks to Craig Hobson converting, up stepped Elliott who saw his effort palmed onto the post by Nicholson and the Reds ensured their spot in the next round. We will host Buxton, after they beat Heanor Town 2-1; at the Impact Arena in the Third Round, date and kick off time to be announced in due course. ALFRETON: Nicholson; Clifton, Riley, Gowling, Hinchley, Lynch, Platt, Chettle, Bacon, Hobson, Styche. Subs [non used]; Brough, Hill, Harrison, Grice, White. GLOSSOP: Saunders; Russell, Stachini [Thornley 19], J.Hill [Hickman 68], McClellan, Thornton, Bennett, Elliott, Boyle, Bryant [Tuohy h/t], Latham.